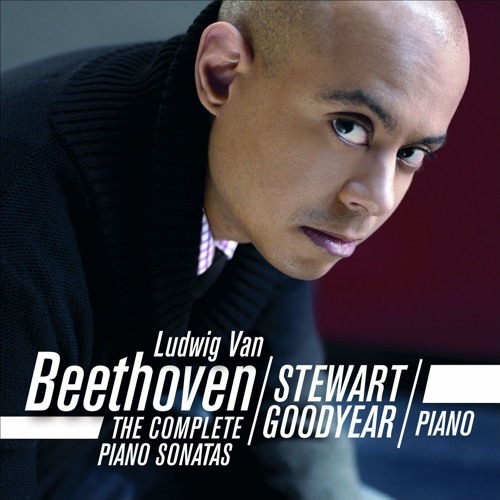 My first encounter with the talents of Canadian pianist Stewart Goodyear was his recent superb album in which he replicates Glenn Gould’s first public recital. He was three when Gould died but he followed, geographically, in his footsteps, studying at the same conservatory. Since then, the 40-year-old has amassed an impressive discography, as well as a reputation as a composer and improviser. His fame is beginning at last to spread outside the North American continent. When you road-test a box of the complete Beethoven piano sonatas the showroom model you take for a spin is, for me at least, the Hammerklavier. This most challenging of the 32 is the litmus test – pull this behemoth off and you have yourself a winner. Goodyear certainly starts at full throttle and, speedy though never hasty, he gives you a thrilling ride. You sense the excitement he feels at being able to handle this beast – fast around the curves and smooth and powerful along the straights. He’s thought it through and come up with something fresh and highly personal. Not that he neglects the other 31 sonatas – far from it. He ticks all the boxes, letting the music speak and with a composer’s awareness of structure, alive to the drama and dynamic shifts, but with exemplary poetic sensibility. So, the only mystery is why it has taken six years to reissue this 2012 box of magic. The wait has been worth it. There’s so much here to treasure and admire. Buy it now.